From my home studio in Kenilworth, Warwickshire, West Midlands I offer a complete bespoke design and dressmaking service for made to measure wedding dresses, bridesmaids, baptism and eveningwear. I also undertake couture alterations or reworking of vintage dresses. 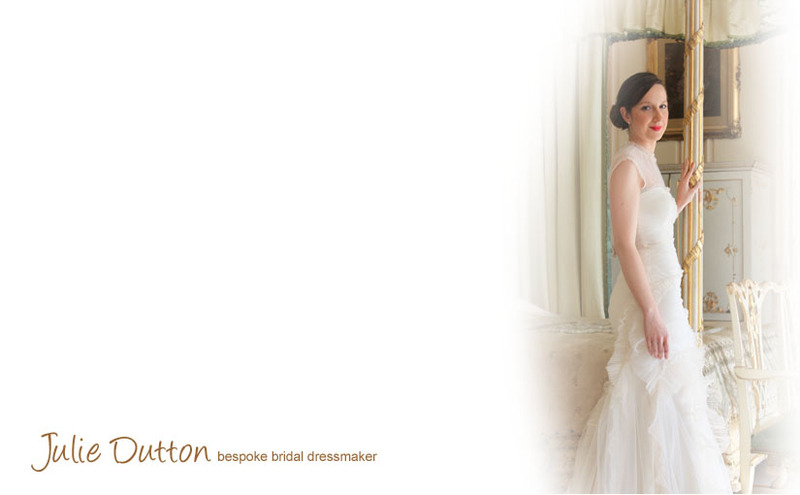 Brides can come to me with their ideas which I interpret using my years of experience of bridal and women’s wear. The unique design elements of a dress could be inspired by historical costume, film, theatre or vintage, but the outcome is a creative, contemporary, stylish gown which fits the client perfectly. Finishing touches of hand-embroidery, embellishment or bespoke beading add the extra magic. I have an extensive collection of bridal fabrics and can source organic and ethical fabrics or incorporate heirloom textiles. The emphasis is always on reflecting your personal style and vision in the creation of your own custom made handcrafted dress. Please go to the about page to read more.